This set of Applied Chemistry Interview Questions and Answers focuses on “Classification of Crude Oil based on their Composition”. 1. Paraffins are obtained by______ process from petroleum. Explanation: Fractional distillation is the process in which the petroleum is refined and in this process at every stage there will some bi-product and at a certain stage paraffins are obtained in this process. Fermentation is used to produce the alcohol and filtration is the process of removing impurities. Explanation: Paraffins are used as lubricant as it is having oily nature. Coolent is the substance which is used to cool down the system. In nuclear reactor water is used as coolent. Aniline is the example of dye. Explanation: The liquid paraffins are used for medical purposes. They are mainly used in ointments and gel type medicines.Inhibitor means negative catalyst. Explanation: The general formula for Naphthenes is CnH2n. The general formula for paraffins CnH2n+2. The general formula for aromatics is CnH2n-6. Explanation: Naphthenes can also be called as cyclo alkanes. Aromatics are mostly benzene rings. Explanation: Cyclo paraffins are the Naphthenes having more than 20 C-atoms. The other cyclo compounds may have more than 20 carbon atoms but they are not Naphthenes. Explanation: Olefins are slightly soluble in water. The branching increases the solubility of hydro carbons(Olefins). group. –(–CH2—CH2–)n— is the structure of ethylene. 9. Olefins containing 2 to 4 carbon atoms are ______ at ordinary temperature. Explanation: The olefins containing 2 to 4 carbons are very small hydro carbons and they will be in gaseous state generally at room temperature. Explanation: Aromatic compounds are produced from coal tar. They are of fruity odor that means they will have some sweet smell. 11. Aromatic compounds are _____ with water. Explanation: Aromatic compounds do not dissolve in water. The do not form lumps with water but olefins will dissolve in water slightly. Explanation: The flame color of the aromatic compounds is in yellow as a lot of carbon in the compound changes into carbon black results in yellow flame. 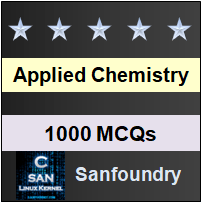 To practice all areas of Applied Chemistry for Interviews, here is complete set of 1000+ Multiple Choice Questions and Answers.